What is Sora (formerly OverDrive)? Sora is the Etiwanda School District’s web-based digital library. It allows students and staff to read eBooks and listen to audio books online from any location that has Internet access or off line using a variety of eReader devices (Kindle, iPad, iPod Touch, computer, cell phone, MP3 player, Nook tablets,…). Patrons can search our virtual bookshelves for specific titles and check-out one title at a time for up to one week. How do I log into Sora? 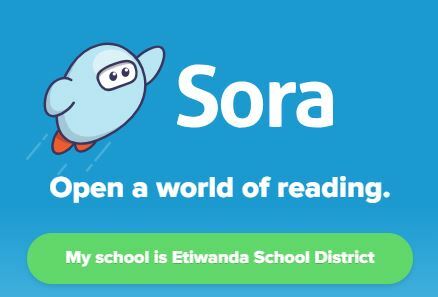 All students in the Etiwanda School District can access Sora from school and home for free by logging in to their district issued Google account and clicking on the Sora icon above. If you have any questions about logging in, please email library@etiwanda.org. How many eBooks may I check out and for how long? 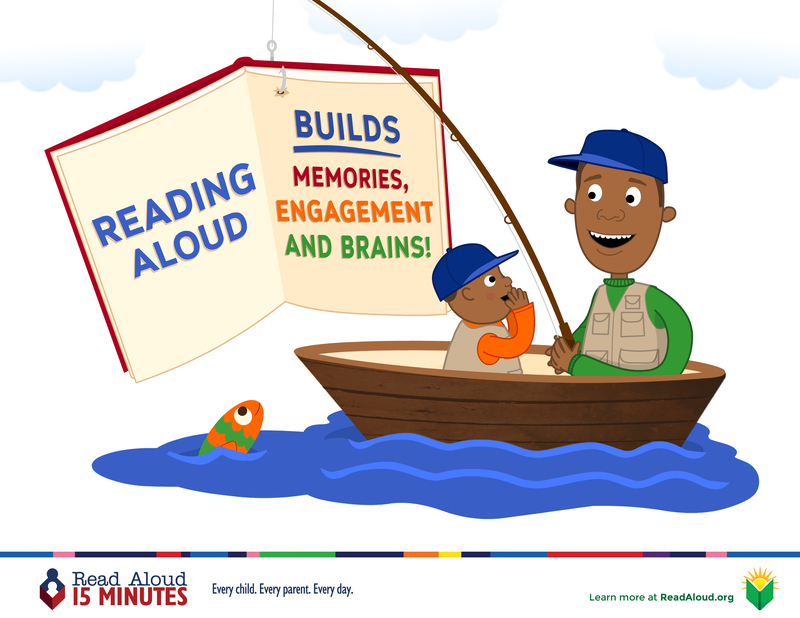 For now, students and staff may check out 3 books at a time for up to one week. As our eBook collection grows, the number of books and the length of check out will expand. Once you are done reading a book, you may check it back in by finding it on your shelf, clicking on Options and selecting Return. This will allow you to check out a new book . How do I read books on Sora offline without an internet connection? To access books when an internet connection or mobile app is not available, you can download titles for offline use at soraapp.com. Note: This new option is available for students using either Chrome or Firefox. Students will need to download books over an internet connection before reading offline. Click here to learn how to download a book from your browswer. After downloading your book, click here to learn how to use Sora offline to read your downloaded book. What devices support the eBooks on Sora? The eBooks from Sora may be read using a variety of devices. Download the Sora app to use on your device. What do I do if I can’t get Sora to work? Try using one of the resources below. If you are still having trouble, contact the Library & Media Services Department at library@etiwanda.org or 909-803-3318. This site hosts a collection of eBooks for Etiwanda School District student use at home and in the classroom. This site hosts a collection of eBooks for Etiwanda School District student use at home and in the classroom. Current subjects include animal, science, biographies, social studies, and dinosaurs. For home use, you need to obtain the password from this document. Please note, that the student must be signed in to their district/school issued Google account to access this information. Students in kindergarten and first grade should contact their teacher for their login. If you have questions, please email district library staff at library@etiwanda.org. This site hosts a beginning collection of fiction and nonfiction eBooks for Etiwanda School District student use at home and in the classroom. For home use, you need to obtain the password from this document. Please note, that the student must be signed in to their district/school issued Google account to access this information. Students in kindergarten and first grade should contact their teacher for their login. 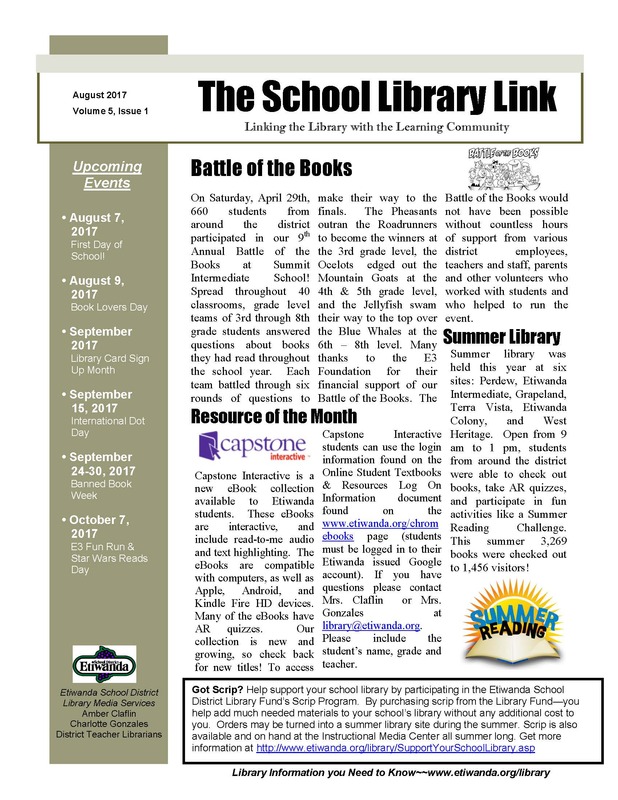 If you have questions, please email district library staff at library@etiwanda.org. ProQuest Ebook Central lets you quickly and easily find relevant ebooks and chapters; read online; search within the ebook; and highlight, take notes and bookmark pages in your online copy, stored on your bookshelf for you. You can also share your research with others, download ebooks and chapters to your laptop or mobile device, and more. For home use, you need to obtain the password from this document. Please note, that the student must be signed in to their district/school issued Google account to access this information. Students in kindergarten and first grade should contact their teacher for their login. If you have questions, please email district library staff at library@etiwanda.org. Check out eBooks, audio books and videos using your Rancho Cucamonga Public library card. Check out eBooks, audio books and videos using your San Bernardino County library card. Funded in part by a grant from the California State Library, Open Library has a a lending library of more than 200,000 eBooks. There are more than 3 million free eBooks available through Google Books with many others available for purchase. This service links through Google accounts. This site offers over 40,000 free ebooks: choose among free epub books, free kindle books, download them or read them online. This site lists more than 600 sites that offer legally free eBooks to download or read online.